The road less traveled… Byways is bassist Bob Gingery, saxophonist Hashem Assadullahi, vocalist/pianist Julie Milgram and percussionist Michael Vitali a collaborative quartet exploring the intersection of pop, jazz and world music. Gingery has brought together three of his favorite musicians to form a group with a focus on melody and groove. While firmly rooted in the jazz tradition his originals have always been informed by pop, world and classical music and Byways is a nod to those interests. 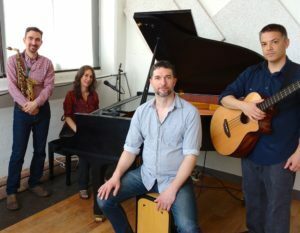 The trio covers music from the best songwriters and often fuses arrangements with latin and world music rhythmic elements.